"Melinda Doolittle's powerful voice and engaging presence brought the house down …Whenever she takes the stage, you can bet the show is about to go to the next level." "Doolittle has a sweet innocence that belies her great talent. What's not to love about this girl?" It’s my Mommy’s birthday today! If you were ever wondering where I got my silliness from, look no further. 😂Love this lady with everything in me. Happy Birthday Mommy!!!! San Diego!!!! You’re up first in this California run! I’ll be there May 7th at one of my favorite places @ma4sd!!! Get your tickets now! The link is in my bio. Palm Springs!!!! I’m coming back to you! May 11th! Cannot wait to see you again at the fabulous @toucanspalmsprings! Come on out! Ticket link is in my bio! Los Angeles, CA!!!! You guys!!! I can’t believe I’ve never done my show in LA! What in the world?! So honored to be at the amazing @catalinajazzclub May 8, 2019. Next month! Tix are on sale starting today. Link is in my bio. Cannot wait to FINALLY see my LA peeps! I floated in the Dead Sea after rubbing mud all over myself today AND LOVED IT. Those who know me know what a miracle this was. Israel has my heart, and these women I’ve been on this pilgrimage with will be etched on it forever. There’s no way I’m coming home the same. Absolutely life changing. Enjoying the beautiful sites in Israel today. What a relaxing time in the land of the Lord. We still have almost a week left in the beautiful land of Israel. To say this pilgrimage has been life changing would be the understatement of the year. I’m so grateful to @kristimclelland and @travelthetext for leading us so well and actively making me fall in love with Jesus more and more each day. My mind is blown, my heart is full. On top of all of this, I get to experience it with some of the best women in the world. With as much as we’re learning, we’re also having a blast doing it! This is us cruising down The Sea of Galilee. Can you even?! Cuz I can’t. Having my Mommy on this experience is amazing! We’re loving every second! This is the Wilderness of Zin...think Moses and the Israelites for 40 years. It’s one thing to read it. It’s a whole ‘nother other to see it for yourself. Wow. Can you tell we’re happy? Melinda Doolittle is a soul–stirring songstress. She is a flawless vocalist with irresistible artistry and effortless style compelling her audiences to keep listening. Tone deaf as a child, Melinda’s choir teacher would plead with her not to sing, but just silently move her mouth. Undaunted, her love of singing drove her to enter a talent show in the seventh grade where she stunned the audience with her miraculously spot on vocals and beautiful voice. She never looked back! Melinda graduated with a Bachelors in Music from Belmont University in Nashville, TN. She became a highly sought after background vocalist singing for musical icons including Michael McDonald, Aretha Franklin, BeBe and CeCe Winans, Aaron Neville and Jonny Lang. Doolittle became a household name during season six of American Idol in 2007. She came in third in the voting, first with Simon Cowell calling her his “personal favorite” and quickly became the sweetheart of American Idol winning over the hearts of all with her stunning powerhouse vocals and her personal charm. In 2009, Doolittle released her debut album Coming Back to You garnering rave reviews from critics, including The New York Times, which hailed her as one of the most “phenomenally gifted” singers in years. In 2013, she released her sophomore album You’re The Reason giving fans yet another opportunity to hear her impeccable vocals and revealing a bit more of her personality. People Magazine stating, “Her voice is a slinky purr then a mighty growl that will keep you coming back for more.” In the middle of her album releases, she penned her book Beyond Me: Finding Your Way to Life's Next Level. Melinda was also the well-loved co-host of TV Line’s Reality Check. Doolittle continues to thrill audiences everywhere from the Rock and Rock Hall of Fame to The White House, from the Copa Room to Carnegie Hall. In addition, she has been a featured guest with the Boston Pops, Charlotte Symphony and United States Air Force Orchestra to name a few, including a featured performer at the 2015 Boston Pops Fourth of July Spectacular. She is currently headlining her own soulful show Great American Soul Book. In thankfulness for all she has been given, Doolittle gives back to these amazing organizations: Vanderbilt Children's Hospital, Ronald McDonald House, The League, and Malaria No More (Presidential Delegate to Africa). Postmodern Jukebox have sent Melinda Doolittle on a ride. The web’s favorite cover band enlisted the American Idol alum for a 1930s-inspired take on Britney Spears’ modern classic, “Toxic.” The cover comes from their latest album Squad Goals, out now. Fox has put the finishing touches on its “American Idol” series finale plans, on Thursday announcing a three-night event that will feature performances and surprise appearances by successful alums and a 90-minute retrospective of the series that changed the face of television during its 15-season run. 6. 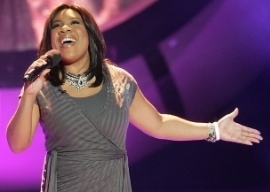 Melinda Doolittle (Season 6, placed 3rd) One of the best pure singers to appear on the Idol stage, Melinda Doolittle turned in powerhouse performances week after week — ranging from Faith Hill and Bon Jovi, to Donna Summer and Lieber and Stoller. The former backup singer operated in the tradition of Aretha Franklin and Tina Turner, imbuing the truncated versions of her chosen songs with pathos and exquisite phrasing. She didn't win, but she set a standard for those who would follow her. MELINDA DOOLITTLE: ONE OF THE 14 GREATEST AMERICAN IDOL AUDITIONS EVER!!! Melinda Doolittle, Season 6, "For Once in My Life"
"Speaking of infectious charm, there's season-six third-place finisher Melinda Doolittle..."
So many of your songs are about love, why do you like to sing about love? “The unquestionable highlight of the concert’s first half, and arguably of the entire show, was a return performance by Doolittle, whose three-song spot culminated in a fiery “Proud Mary” sung as a duet with the gospel singer Michelle Brooks-Thompson, a finalist from 'The Voice' and a gospel recording artist. 'I grew up with a big ol’ smile and not much of a voice,' Doolittle had confessed to TV host Lisa Hughes during her opening number — a confession that made the big-voiced singer all the more impressive." "THE BOSTON POPS AND KEITH LOCKHART, CELEBRATING HIS 20TH ANNIVERSARY LEADING THE FIREWORKS SPECTACULAR, TO BE JOINED BY MICHAEL CAVANAUGH, MELINDA DOOLITTLE, SONS OF SERENDIP, THE BOSTON CRUSADERS, MICHELLE BROOKS THOMPSON, AND THE USO SHOW TROUPE "